Summary:Hostgator has develop a reputation for having great support along with great prices on their hosting plans. 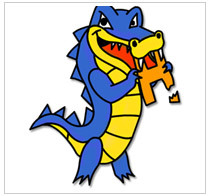 HostGator is a world leading provider of shared, reseller and dedicated web hosting. Privately held and based in Houston, Texas with a full in-house support team of over 150 industry veterans. Customers are not required to sign up for any contract longer than month to month service. HostGator provides over 150,000 customers with innovative products and services designed to complement their existing businesses. From Freelancers, to Fortune 500 companies in more than 170 countries worldwide.